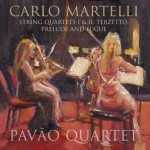 The Pavão Quartet’s new album, Carlo Martelli Chamber Works, is now available in digital format. Our good friend Carlo Martelli has supported the quartet since its formation, providing marvellous arrangements that featured on previous albums Someone to watch over me, A Christmas Collection, and Dreaming. We’re pleased to now have the opportunity to explore more of his classical side, being the first to publish recordings of Martelli’s chamber works. You can read a review on MusicWeb International. Carlo Martelli Chamber Works is currently available for purchase in MP3 format on Amazon MP3 and iTunes. Physical distribution in CD format will be available soon.